Striking color contrast! Layers of sunshine-bright copper-gold petals radiate out from a large, dark center. Blooms heavily from midsummer to frost; grows 2-3 ft. tall. A longtime favorite for cut bouquets. Spreads to fill an area fast. 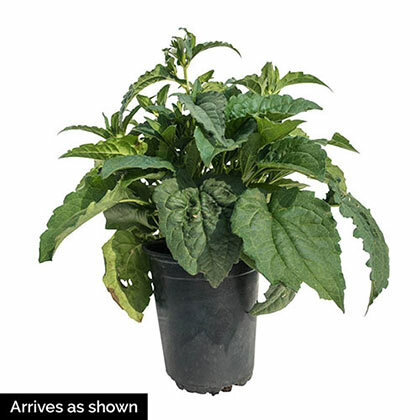 Easy to grow—tolerates a wide range of conditions but prefers full sun and well-drained soil. Available in a gallon pot and shipping now. Potted. Zones 4-9. FoliageOblong to lanceolate, dark green foliage. Flower FormDaisy-like, appear singly on stiff, branching stems in a prolific, long-lasting bloom. ColorBright gold rays with a deep blackish-brown cone (center disk). PruningDead-head to prolong blooming season. Allow the foliage to die back. CommentsAcclaimed internationally as one of the most popular perennials for the past fifty years, its bright golden-yellow flowers shine in gardens worldwide. In 1937 Heinrich Hagemann observed a glorious stand of Rudbeckia fulgida var. sullivantii at Gebrueder Schuetz's nursery in the Czech Republic. 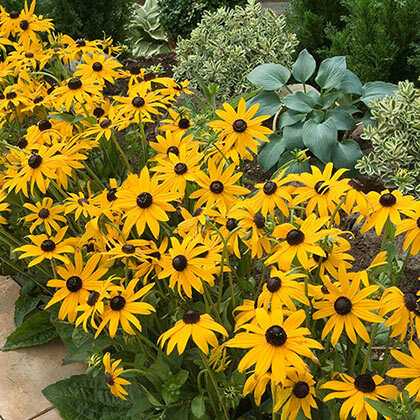 Recognizing the superiority over other commonly-grown Rudbeckia species, Hagemann convinced his employer Karl Foerster of Potsdam, Germany to propagate his discovery. World War II interfered with the planned debut of the plant and it was not until 1949 that the triumphant success of Rudbeckia fulgida var. sullivantii renamed 'Goldsturm' began. 'Goldsturm' translates to English as gold storm. Heinrich Hagemann, although retired, maintains an active interest in his company, the world-renowned Hagemann Staudenkulturen. DepthPlant top of root ball at soil surface.